The episode title this time really says it all: “Josh Is Irrelevant.” As disconcerting as it might be for Josh Chan himself to hear, he was never the point of this show. Instead, as the old saw goes, it was the friends we made along the way. And they’ve all come out to support Rebecca after her suicide attempt, defying her belief that she’d alienated everyone in her life. That made this episode a welcome moment of calm after a bleak, tense, out-of-control start to the season. As the handsome Dr. Dan (or if you’re Paula, “Dr. Daaaaamn”) explains, people who survived a suicide attempt often experience a burst of sudden energy, and that spirit of excitement seems to have carried over to the episode itself. After five increasingly nail-biting installments, it’s nice to be able to roll into the midseason hiatus on some mellow positivity, rather than sink deeper into Rebecca’s dark places. While a stay in the hospital does appear to have done Rebecca some good, her friends aren’t handling it quite as well. Paula, who was finally reconnecting with her family in Palm Springs, is now more codependent than ever, rushing to Rebecca’s side straight from her pool chair (and even trying to sleep in her bed). Valencia, desperate to control both her emotions and her bowel movements, has dedicated herself to the tending of Rebecca’s social media feed. Only Heather remains characteristically nonplussed, getting new squeeze Hector to deliver her snacks at the hospital and lamenting her inability to jailbreak an avocado in a house that’s been stripped of knives. In private, though, Nathaniel’s mom admits to the truth. Not entirely, and not easily, but enough to clear the air. It’s a nicely crafted rejoinder to Rebecca’s happy-ish ending: Thoughts of suicide also haunt people who are a lot less externally intense than Rebecca, and who have no one to help them. But even though the Plimpton family may be “no hugging, no learning” types, it’s still possible for people like them to achieve closure. It’s a nice way to deepen Nathaniel’s relationship to Rebecca without having him pursue her in an overtly romantic way, which would have come off all wrong at this juncture. Thankfully, this is also a show with the sensitivity not to be glib about the reality of BPD, long considered one of the hardest psychological disorders to effectively treat. As much as Rebecca wants to break with her previous program of obsession, it’s likely that this treatment will become the new “man” in her life, and offer a unique opportunity for CXG to explore the heretofore unseen and unglamorous world of receiving treatment. Greg’s AA plotline before he left the show touched on that a little bit, and I’m excited to see what the show can do when the idea is front-and-center. As the past two episodes have shown, nearly everyone in Rebecca’s work and home lives is also suffering in their own ways, albeit less intensely than Rebecca herself. In the same way she’s encouraged her friends to achieve their goals, come out of the closet, and get their lives together, could Rebecca be the ringleader of a gang of wanderers all trying to get on the road to Oz, a.k.a. therapy? It’s hard to say, but now we are truly at the “end of the movie,” and I genuinely have no idea what the world of this show will look like when it returns in mid-December. But I’m excited to see where its new narrative takes us. • One notable missing person in this episode: Naomi. She and Rebecca are obviously on terrible terms right now, but a suicide attempt and landing in the hospital seems worthy of a reunion. • I have to admit that I wasn’t really feeling Valencia’s “This Is My Movement” song, but scatological humor pretty much never connects with me, especially when it’s a one-note joke. It was nice to see Gabrielle Ruiz get a song of her own, though — I don’t think she’s had one since “Women Gotta Stick Together” in season one. • That gator toy that Nathaniel is obsessed with has an extremely Rebecca name: Ruth Gator Ginsburg. 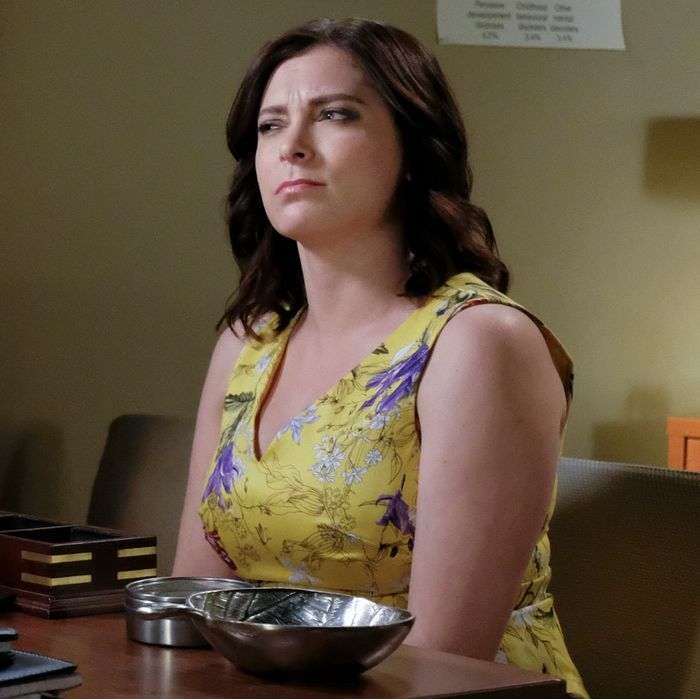 • We also learn where Rebecca’s “what?” on the toilet in the new theme song originates, in keeping with this show’s unwritten promise of integrating each theme into the plot itself. • I don’t know who I felt worse for when they got rejected: Josh, or that insanely adorable puppy he bought for Rebecca. Are we sure we can’t add a cute dog to the mix? I’ll settle for meeting George’s cat Andromeda.